You may remember if you read this blog regularly that I attempted to show the process of the development of a painting last year – one of the highland cows. For whatever reason; I lost concentration, got distracted by the children or another of the myriad of excuses that artists deploy when they’re procrastinating, was that the painting was a complete disaster, and ended up ripped up off its stretchers rolled into a dusty tube and joined the collection of cast offs under the dog’s chair in my studio. This time I thought I’d finish the painting first. 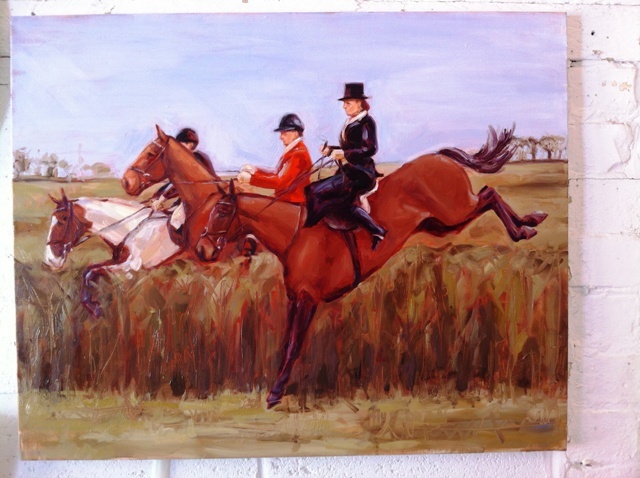 I’ve used a commissioned portrait of a sidesaddle rider to demonstrate. This is the photo I was given to work from, not ideal, but enough. Stage one. Planning and composition. These are small sketches, painted quickly in an hour or two which let me have a look at the balance of the painting, the harmony of colours, and allow me to make mistakes inexpensively. 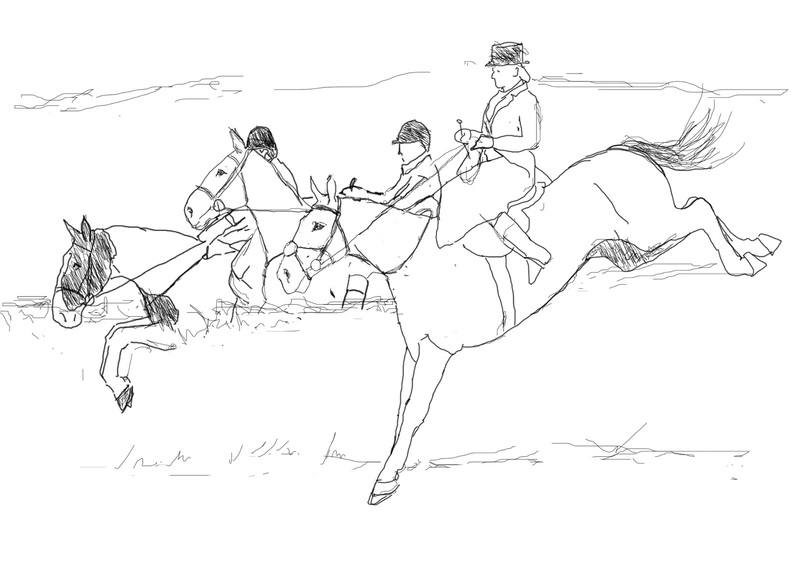 I wanted to go with a plainer background as seen in the largest sketch, but the client wanted a landscape. Once the the canvas is measured out, stretched and primed with a dark ‘ground’ I sketch out the drawing onto the paint with a pen. I now have to order these especially from the States as my uk supplier discontinued them and like many artists I hate to change tools. I have painted with the same half dozen Old Holland oil colours for the past decade. Expensive – one of the tubes is about £40 a go, but worth it. I can’t explain why some paintings work and others don’t, but well planned and thought out paintings tend to work better than those I rush into. I always have an image of what I want to achieve in my head, sometimes I achieve it, sometimes I never quite get there, and on rare occasions I exceed it. The first version of this didn’t work, and got very ‘muddy’ but I was more pleased with the second. Letting it dry, touching up the details and highlights, and varnishing. Then sending the proof to the client, which is terrifying EVERY time. They were pleased fortunately. 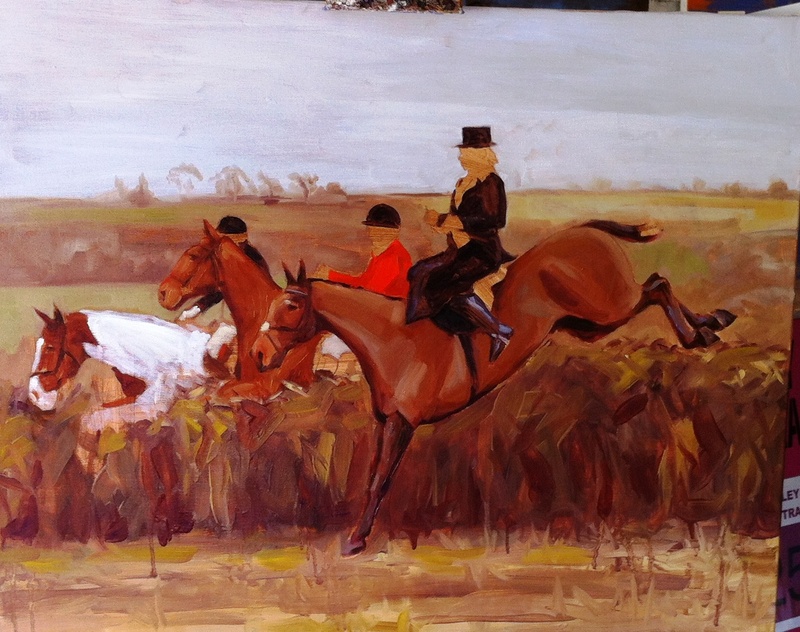 I’m most often asked ‘How long does a painting take?’ and in answer I really have no idea. This was commissioned in May, and delivered in August. If the first version had worked it would probably have been ready the month before. Each painting is different, some are finished in a week, and others take six months.